The Best Laptops of CES 2013: What Laptops? Rounding up the best laptops at CES 2013 is a weird assignment. Sure, we've done it before. But this year, it's different. The fact is, there are no freaking laptops anywhere. 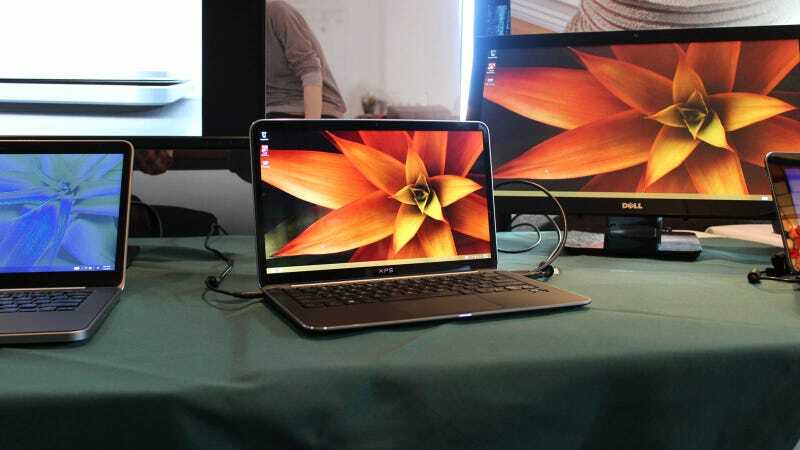 Dell updated its Inspiron line of laptops and showed a version of its solid XPS 13 with a 1080p screen. Samsung leaked this out just before CES, but its Series 5 Ultra and Series 7 Chronos both received spec bumps. Lenovo upgraded the Yoga 11 from an RT device to a full fledged Windows 8 laptop. It also announced the Helix, a Windows 8 convertible running on an Intel Atom (Clover Trail) Core series chip. Toshiba refreshed its midrange laptops, and announced that its Qosmio line will get touch. Sony's T-Series got touch for its 14-inch model, and full HD for its 15-inch model. Oh, and the Duo 11 got a new color. Acer showed some new screen tech in its ultrabooks, but that won't be available for a while. That's not alllll of the news to come out of the show, but it's a good representation of the general tone and tenor. Compared to last year, when CES revealed the XPS 13, the Yoga, a stunning redesign of the Series 9, the Aspire S5, and a bunch of other ultrabooks, this year was a total dud. But again, that's only because PC makers shot their wads back in October. We're sure we'll be seeing new stuff this spring and fall (and probably at next year's CES). All that said, if we haaad to pick some "Best Ofs", they would be the XPS 13 with 1080p and the Yoga 11. The XPS was already very good when it debuted in 2012, and the panel Dell stuck on it is beautiful. And as for the Yoga 11—we loved 13-inch Yoga, and we love 11-inch laptops. It's genuinely nice to see the smaller version get the full Windows 8 treatment.